Ada Reyes holds the hand of her daughter Adamaris Rodriguez. 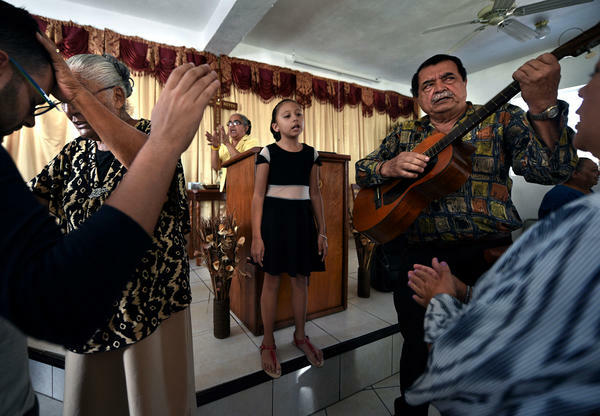 Wilfredo Gonzalez (right), plays guitar during Sunday's service. 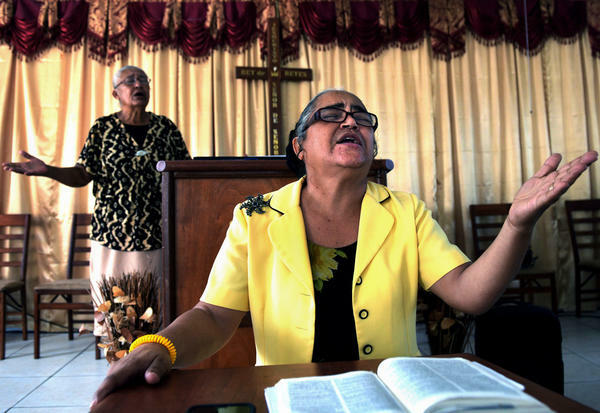 The church's board president, Gonzalez lost three sisters in a landslide during the hurricane. Co-pastor Leticia Gonzalez preaches as her fellow pastor Nereido Gonzalez (left) stands at the altar. 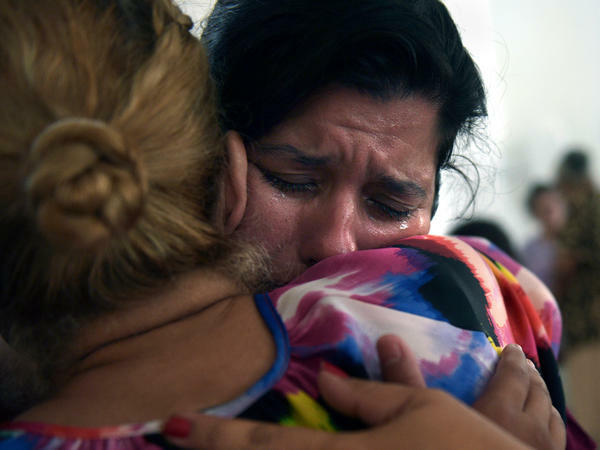 Ada Reyes weeps and hugs Johanna Nieves Diaz as people comfort one another during the church service. "I forget about everything going on in the street for a little bit, at least," Reyes says. Ada Reyes hugs her children as churchgoers pray. Rubble from Hurricane Maria surrounds the Iglesia Cristiana Monte Olivar church. 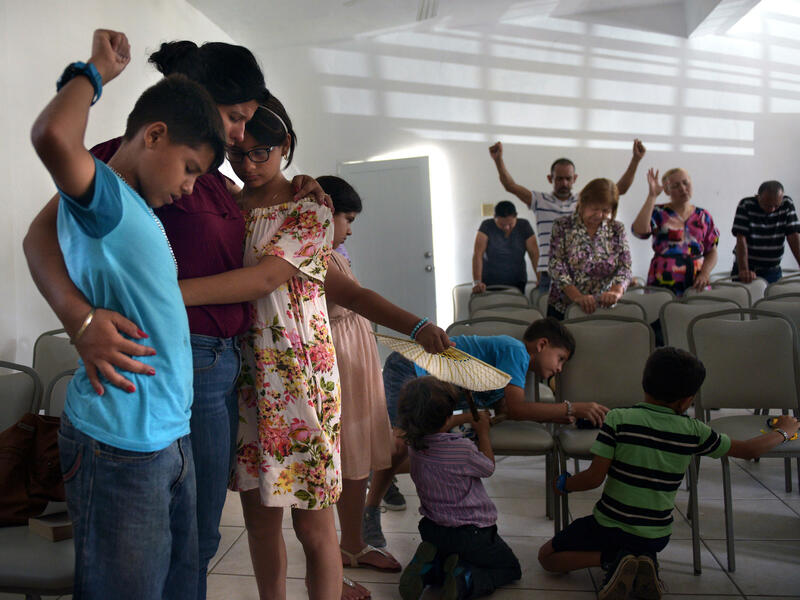 Every Sunday since Hurricane Maria ripped through Puerto Rico, Ada Reyes and her four children have walked half an hour to church. 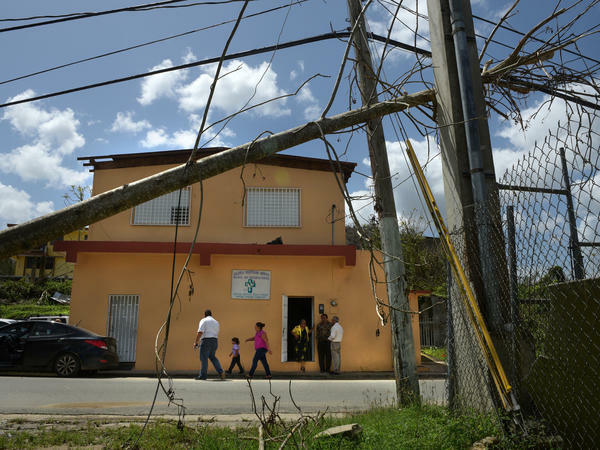 Down a winding road, dodging fallen trees and debris, they walk past concrete houses still bearing flood marks, and finally cross the Vivi — a small river in Utuado, a city in the central mountain region. The Iglesia Cristiana Monte Olivar church is small: one room, with a few rows of chairs all facing two podiums up front. There are about 30 people, all standing when we arrive. Two associate pastors offer a prayer and members pray over each other, some in tears and embracing each other as they pray. It's been a hard few weeks in Utuado. Many roads nearby are still too dangerous to drive because of heavy flooding and strewn debris. Schools remain closed. Businesses that are open, including a Walgreens and an AutoZone, are powered by generators and have long lines and full parking lots seeding traffic jams. People here are about to start their third week without electricity or water. Nearly 90 percent of the island is still without power. Reyes' home suffered some roof damage, which has let in the rain they've been having this past week. Her car fared much worse — it's pinned under a tree, so she's had to go everywhere on foot. Still, she makes the trek to church because it's the highlight of her week. "It's like my breakthrough," she says. "I feel like nothing's happening around me when I'm here. I forget about everything going on in the street for a little bit, at least. It gives me strength to keep on with my kids and the faith to see what happens." Before Maria, the church held several services. But since there's no power, they now hold only one. 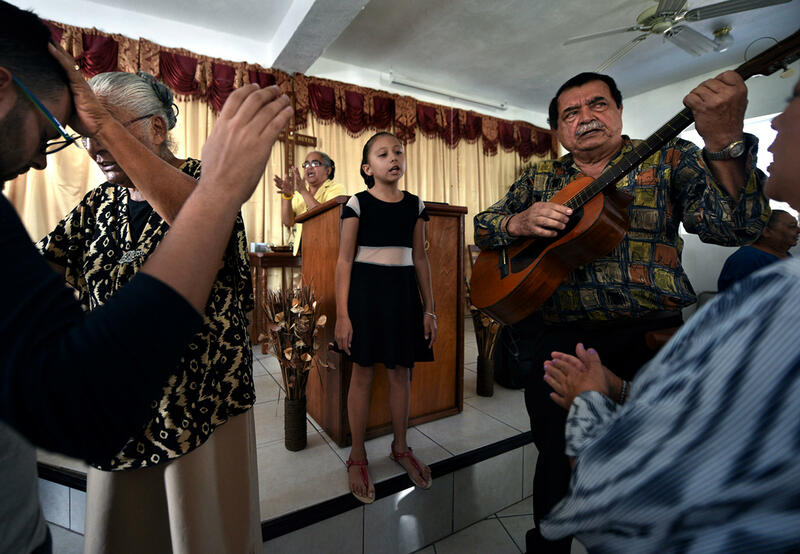 That service, at 10 a.m. on Sundays, makes it seem like nothing has changed, says Reyes. An 11-year-old boy sits near her, his Bible snugged into a denim case spread open on his lap. A teenager stands at the podium with her iPhone playing instrumentals; she sings along. She's soon joined by a man playing the guitar. The congregation joins in, singing: "I hope the Holy Spirit takes care of everything. ... There is nothing that will keep me from worshiping. ... All I need is his presence." The church community has come together after hurricanes Maria and Irma, says Carmen Leticia Medina Gonzalez, an associate pastor. During the service, she passes out white envelopes filled with cash — money raised by the congregation for members who are struggling. As people approach the podium to collect, Luis Collazo, sitting in the back, stands up to offer help. He's able to remove debris or clean up a house, he says, turning to address the pews. He pauses when he sees Wilfredo Gonzalez, who was playing the guitar earlier in the service. Gonzalez is the church's board president. He lost three sisters in the hurricane. All were in their 70s, he says. Two were bedridden. A few days before the storm, he moved them to a house he thought would be out of the flood zone, but a landslide took them under. For eight days, their bodies were trapped under the debris. He's still waiting for the coroner to properly identify them. Attending church gives him comfort, he says: "Here, we are united."